Mix all the ingredients in a bowl. Taste and adjust seasonings. 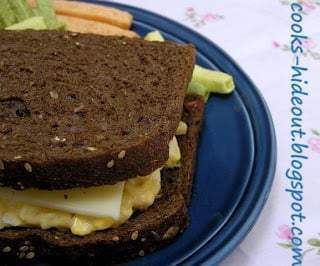 Toast 2 slices sandwich bread (I used German dark wheat); On one slice; put half the egg salad, 1 slice of cheese (I used Havarti cheese) and a slice of tomato; cover with other slice and enjoy with veggie chips.